I saw this yesterday on superduperlove@wordpress blog.. this site is one of my favorites for posting the translation of sujucyworld entries. One of the things she posted yesterday the new entries from Heechul and Donghae’s blogs. And what caught my eye is this picture… where we see Kibum! ahahaha.. I’m sure most suju fans have been wanting to see him for a long time! The boys took the time off and went to Kangneung. 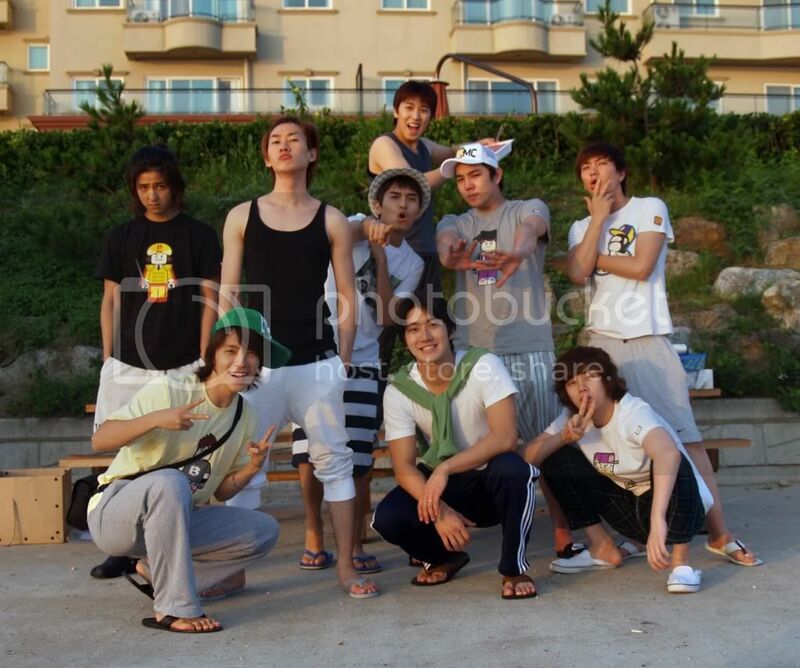 I’m not sure how many boys went there but this picture had 9 boys.. and I saw another picture with Kangin and Shindong, I think Yesung is the one who is missing :D. The boys’ outfit were very different from the usual Sorry Sorry costumes — wearing regular t-shirts and slippers – they looked very common! ㅋㅋㅋ but they still looked cute! I had sometime to post things! yipee! And I really really really needed tomake this post! I was checking allkpop.com for any updates and lo and behold I found one update about the group I’m really missing – actually it’s 2 updates… I will be posting the other one after this entry. Anyway I cannot not post this because I saw this performance of the Cebu Dancing inmates.. and that was the first time that they performed that dance. If I am not mistaken, well based on the boy’s costume, they watched it during their recording of their performance with 3 musketeers (they sang Kaja). The boys are really handsome.. kiki and though the steps of the inmates were not exactly the same as the exact Sorry Sorry steps, it’s nice that they appreciated it! So I know this CF has been aired for a long time already but I had to post this because Donghae is in this CF (unni if your reading this blog please don’t kill me.. kikiki). This is the CF for Happy Bubble, I’m confused if it is a facial wash or it is a body wash, but anyway it’s either of those two. The CF features Han Ji Min (the gril from Cain and Abel – Soo Ji Sub’s recent drama), and Super Junior’s Donghae and Kyuhyun. Donghae looked very cute in this video! Oh and last week I got my very own Super Junior Third album – the repackaged version, fresh from Korea! ehehehe.. my Unni gave me one because she loves me! I was very happy when I got it! Gomawooyo unni! I miss you already! this blog please don’t kill me.. kikiki). very cute in this video! I haven’t posted anything on this blog for about a month now.. I think it’s a month since I last posted July 19. Mianheyo – the last month was pretty topsy turvy, hectic, busy and crazy month for me! But thank you to all those who visited my blog… I noticed I hit more than 200,000 visits already… Gomawoo.. However I have a request… since I cannot understand other languages.. please have your comments written in English.. this is so I can understand your comments… also for the benefit of all those who visit the blog and who want to read your comments… thanks! I will probably be writing something by this weekend.. or maybe after this weekend… but for now I will leave you with these pictures.. This picture is so cute… but I need to go for now! I’ll be posting something soon!